Login to your Zoom web portal and navigate to My Recordings. 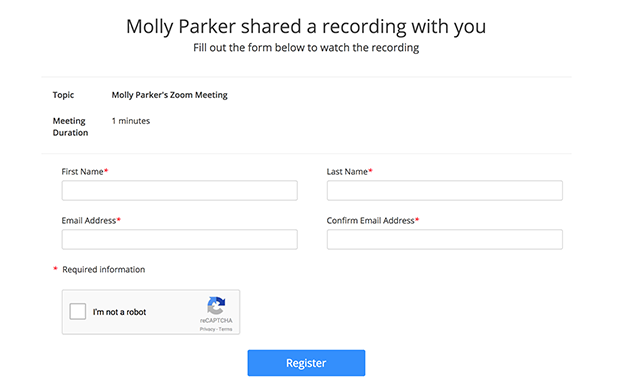 Click on the meeting topic for the recording that you would like to make on demand. Toggle On Demand (Registration Required) to on (blue). The recording will now be on demand. If user access the link to the view the recording, they will be required to register before viewing. After registering, they can view the recording. Click on the topic for the recording. This will open the on-demand settings. 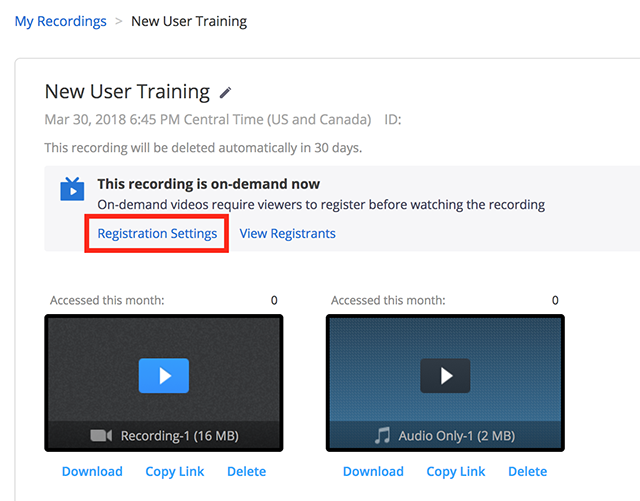 Approval: Select if you want registrants to be automatically able to view the recording after registering, or if you would like to manually approve registrants to view the recording. Notification: Check if you would like to receive an email when someone registers to view the recording. Other options: Check if you would like to show social share buttons on the recording registration page. This will include social share buttons for Facebook, Twitter, and LinkedIn. Questions: Click on the questions tab to adjust which fields are shown and required when someone registers to view the recording. 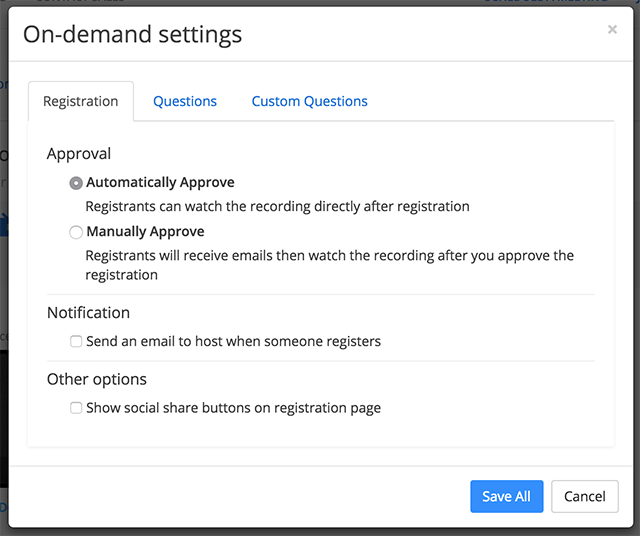 Custom Questions: Add custom questions for viewers to complete when registering to view the recording. Click Save All when done. If manual approval is turned on for an on-demand recording, the user will be taken to a page letting them know that their registration information has been submitted. Once their request is approved, they will receive an email with the link to view the recording. If their request is denied, they will receive an email notifying them that their registration request was denied. The registrant information will be shown in three tabs: Pending Approval, Approved, and Denied. Pending Approval: Check the box next to any users you want to approve. Click Approve. Check the box next to any users you want to deny. Click Deny. Approved: This lists any users who have access to view the recording. Denied: This lists any users who you have denied from accessing the recording.